An independent self-drive vacation encompassing the highlights of New Zealand’s South Island including kayaking, whale watching, one of the world’s great train journeys, Milford Sound and outdoor adventure. DAY ONE – PICTON, WELCOME TO THE SOUTH ISLAND! You’ll pick up your rental car from either the Picton Airport or the Ferry Terminal. Enjoy a leisurely, scenic drive to Nelson. Discover the beautiful beaches, tidal estuaries and rivers of the most scenic kayaking area of the Abel Tasman National Park. Cruise the forest-fringed bays and granite archways of the unique coastline, explore the wondrous headlands, coves and islands of the coast. Stop at a sheltered cove for lunch then relax on the beach, swim or explore the native forest. Wake up and take a scenic drive to Kaikoura – famous for whale watching, dolphin swimming and spectacular scenery. Every Whale Watch tour is a unique experience and the sightings vary. Giant Sperm Whales are the stars of the show and year-round residents. A typical whale watch tour may encounter New Zealand Fur Seals, pods of Dusky Dolphins and the endangered Wandering Albatross. Depending on the season you may also see migrating Humpback Whales, Pilot Whales, Blue Whales and Southern Right Whales. This afternoon drive to Christchurch. The largest city in the South Island offers fresh and exciting attractions, a lively café scene, lots of Victorian architecture, and many beautiful parks and gardens. The TranzAlpine scenic train journey travels between Christchurch and Greymouth, from one coast of New Zealand to the other. You’ll see the fields of the Canterbury Plains and farmland, spectacular gorges and river valleys, and the Southern Alps before descending through lush rainforest to the West Coast town of Greymouth. Drive to Franz Josef. 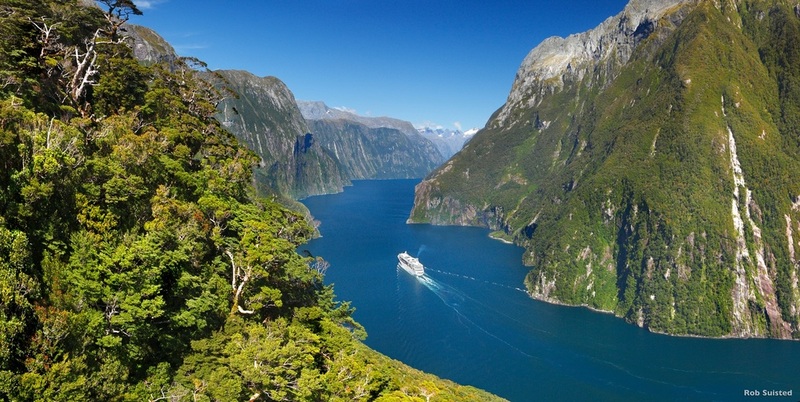 Milford Sound is a world-renowned natural wonder where mountains stand tall, straight out of the sea. Luxuriant rainforest clings to sheer rock walls and waterfalls tumble hundreds of meters to the sea below. Whatever the fiord’s mood – brooding and wet, or tranquil in the sunshine – it will inspire you. The cruise provides excellent viewing opportunities and plenty of time is available to enjoy waterfalls, rainforest, mountains and wildlife. Today enjoy a truly unique outdoor adventure safari. The journey begins with an exciting jetboat ride up the Dart River. You will then be introduced to your Funyak - a unique inflatable canoe. You’ll paddle and drift downstream, taking in all the awe-inspiring sights amidst the Dart River channels. You will stop amongst the ancient beech forest for a buffet lunch and explore hidden side streams, rock stream, rock pools before continuing downstream to Paradise. Take a 4WD coach to Glenorchy, stopping to view the stunning scenery that has inspired films like Lord of the Rings. Transfer from your hotel to Queenstown Airport.